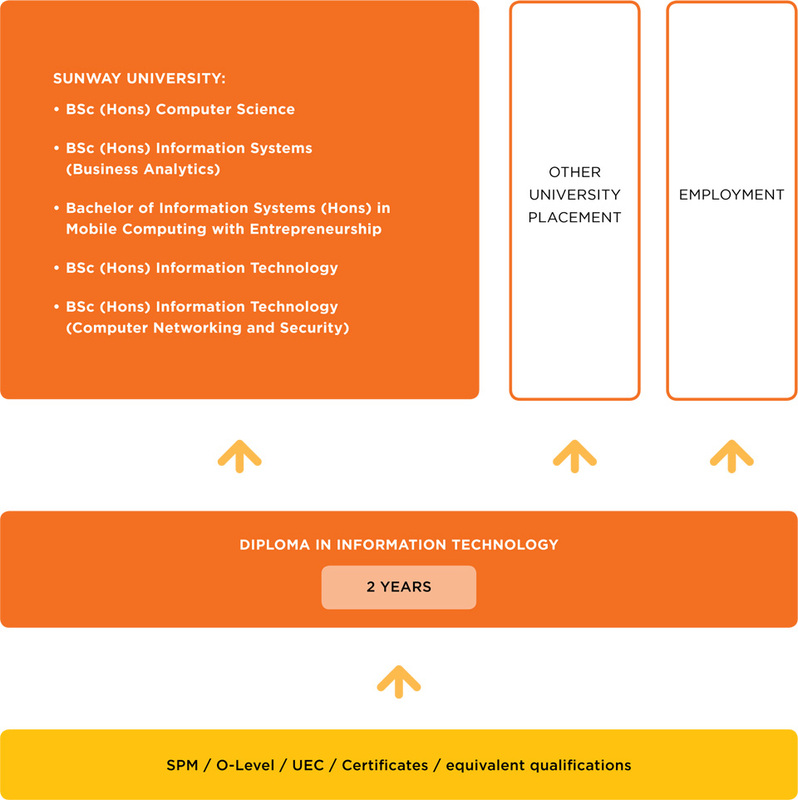 At Sunway College, the Diploma in Information Technology (DIIT) is designed to equip students with up-to-date expertise in corporate information systems, internet and interactive media, mobile communications technologies, computer systems and networking, and software engineering. Through Sunway’s DIIT, students will also develop specialised Information Technology (IT) knowledge in programming, web development and content management systems - operating systems, networking, database modelling and implementation. Students are trained to gain technical knowledge & skills and prepare them for careers in the Information and Communication Technology (ICT) environment. Students will gain hands-on experience with real industry clients, acquire skills and create network with potential employers. At Sunway DIIT, students are taught communication and personal skills to enable them to interact effectively in the workforce. Lifelong learning skills are integrated into it courses and evaluation exercise with the emphasis on critical thinking skills and personal excellence. Sunway College will also assist student develop enterprise skills to maximise employment success. The Sunway College Diploma in Information Technology (DIIT) provides the engagement in a vibrant learning community, building network of like-minded individuals within the institution and the world. Through Sunway College’s online learning portal, E-Learn, students will be able to access online resources and learning activities, access course materials, collaborate with lecturers and fellow students. The teaching & learning of the programme is well supported by the accessibility of educational software, i-Lab, printers and a team of experienced academic staffs on campus. Sunway College has strong partnership with Sunway University, Monash University and industry leaders in the design of curriculum, learning model and building learning facilities. Regular lectures by visiting professors, industry professionals and guest lecturers to expose students to current industry practice, real-world scenarios and technologies to stay abreast of the latest changes in IT. The graduates have the flexibility to exit for early employment in the industry. Our Career & Placement Service Officer offers a range of support for internship, progression and job placement. The major objective of the assessment and examination is to improve student learning and measure their comprehension. Employment outcomes for DIIT graduates varies depending on the level of qualification. This program offers graduates a pathway to more specialised studies, opening up additional career paths in information technology and related industries. Employment for ICT professionals is anticipated to grow strongly in the future. Graduates have the opportunities to advance and/or specialise in a wide range of technologies and be prepared to continue training throughout their career to remain industry relevant. Graduates have the flexibility to specialise in the five areas of interests - Software Design, Information Security, Interaction Design, Business Management Solutions & Game Development. A Diploma in Information Technology is a basis for a wide range of exciting IT-based careers. As a graduate of DIIT at Sunway, students will have a strong foundation in information technology, problem-solving and communication skills for careers in the areas of network management, systems design engineering, software development, web-application development. With increasing adoption of IT across all industry sectors, students can look forward to many exciting career opportunities when they graduate. Students can find employment in various industries, in roles such as - Software Engineer, Analyst Programmer, Gameplay Programmer, Graphics Programmer, Consultant, Web Developer, Information Systems officers or IT support personnel.